“Roman soldiers” outside the Pantheon. Photo via Getty Images. 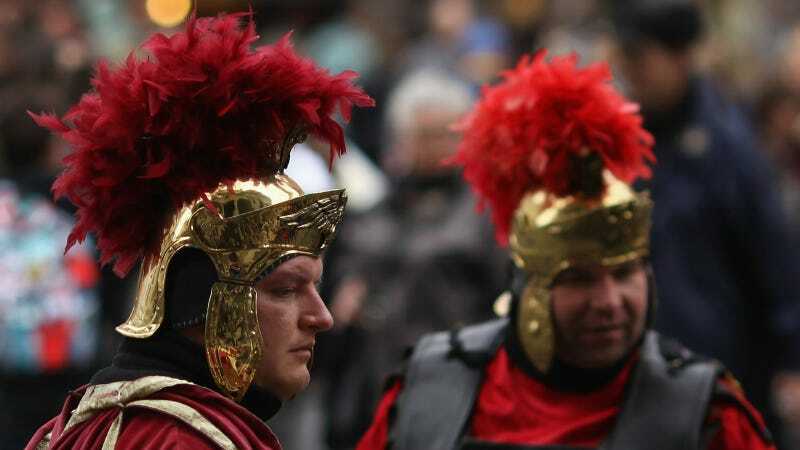 For several years now, Rome has boasted its very own version of the off-brand Cookie Monsters and desnudas clogging Times Square: sketchy dudes dressed as Roman soldiers, looking to make a buck posing with tourists for photos and decried as an annoyance and even a downright menace. They were briefly banned but now they are back. SPQR, baby! Five months ago the administration, led by Virginia Raggi, the mayor, banned the latter-day Roman soldiers from hanging around monuments like the Colosseum and the Trevi Fountain, where for years they have made a living by posing for photographs with tourists and charging money. But the touts – who dress up in tunics, capes and leather breastplates – launched an appeal against the ruling, saying their livelihoods had been ruined. And sure enough, they won: “A regional tribunal has ruled in their favour, slapping down the council’s ban and saying that the centurions and gladiators can resume plying their trade without fear of being hit with a 400 euro fine.” However, the court also suggested clearer guidelines for where these guys can work the crowds and how much they are allowed to charge—in short, calling for regulation over an outright ban. “When we pose for photos we just ask for a little contribution. We makes kids happy, we give out information to tourists. We are happy to be regulated,” insisted Daniele Di Porto, the vice-president of the Centurion Street Artists Association, an organization which does in fact exist. Honestly, these guys probably just give the Colosseum a little authentic ancient flavoring. Pretty sure you could poll any random population from the ancient world—Gauls or Visigoths, Assyrians or Britons—and they’d tell you those guys were a bunch of goddamn dicks.